Weekend drainage work will delay motorists on a small section of Kernan Boulevard at McCormick Road in the East Arlington area of Jacksonville. The red area of the map shows the area of Kernan Road that will be delayed. The green area shows an alternate route motorists can take to avoid the area. The work will trigger lane closures to traffic from 7 p.m. Friday until 4 a.m. on Monday. 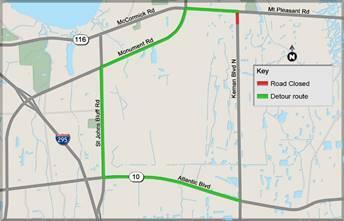 The Florida Department of Transportation says motorists that wish to avoid the delays heading north on Kernan can detour to Atlantic Boulevard. Southbound vehicles can take McCormick. Message boards will help drivers find their way through the construction. The work is part of the nearly $8 million Wonderwood drainage improvement project that’s expected to wrap up this summer. Editor's Note: An earlier version of this story said a portion of Kernan would be closed. FDOT revised its work schedule after the original story was published. It canceled the road closure, instead opting for lane closures.